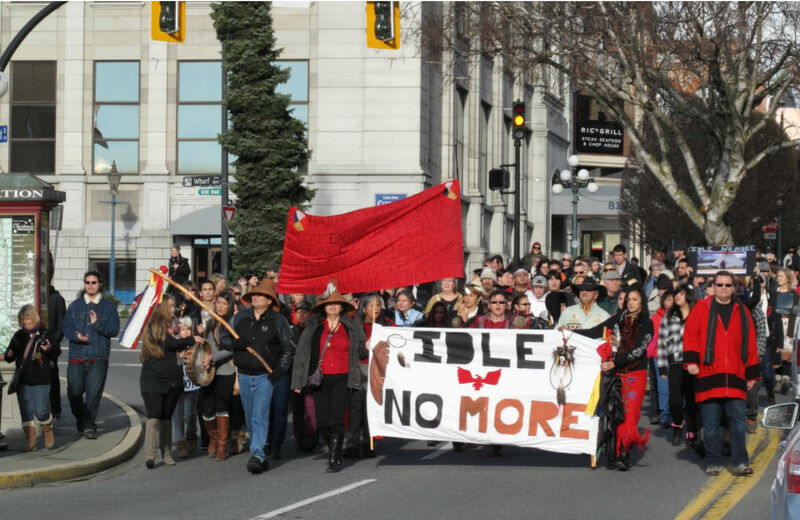 Idle No More is Canada's Occupy movement, but with deep, deep roots. Today there will be global solidarity actions in support of Canada's activists. It feels like [Idle No More] wells up from the same kind of long-postponed and deeply-felt passion that powered the Arab spring. And I know firsthand that many of its organizers are among the most committed and skilled activists I’ve ever come across. In fact, if Occupy’s weakness was that it lacked roots (it had to take over public places, after all, which proved hard to hold on to), this new movement’s great strength is that its roots go back farther than history. More than any other people on this continent, they know what exploitation and colonization are all about, and so it’s natural that at a moment of great need they’re leading the resistance to the most profound corporatization we’ve ever seen. I mean, we’ve just come off the hottest year ever in America, the year when we broke the Arctic ice cap; the ocean is 30 percent more acidic than it was when I was born. Whereas Occupy had a whole host of entirely valid grievances, INM is more focused with an agenda of two goals: sovereignty and sustainability. On December 10th, Indigenous people and allies stood in solidarity across Canada to assert Indigenous sovereignty and begin the work towards sustainable, renewable development. All people will be affected by the continued damage to the land and water and we welcome Indigenous and non-Indigenous allies to join in creating healthy sustainable communities. We encourage youth to become engaged in this movement as you are the leaders of our future. There have always been individuals and groups who have been working towards these goals – Idle No More seeks to create solidarity and further support these goals. We recognize that there may be backlash, and encourage people to stay strong and united in spirit. Their plan of action includes supporting and encouraging grassroots movements to create their own forums to learn about Indigenous rights, building networks across all of Canada and a relationship with the United Nations to raise awareness about these issues, all while acknowledging they are drawing from a tradition of indigenous and environmental activists who helped pave the way for INM. Though First Nations (sometimes referred to as “Natives,” “Indians,” or “Aboriginals,”) make up only three percent of Canada’s population, First Nations people under the age of 18 are the fastest growing segment of the Canadian population, according to the latest census data. The Christian Science Monitor reports that First Nations people increasingly live in urban centers, but many continue to live on remote reserve communities that suffer from inadequate housing and utilities, access to schools, extremely high food prices, epidemics of suicide, and other serious problems. INM emerged from online conversations between four women in Saskatchewan who were concerned about the implications of Bill C-45, a sweeping piece of budget legislation that critics felt would imperil the protection of thousands of Canadian streams and lakes and, by amending Canada’s Indian Act without consulting First Nations, further erode their sovereignty. Of course, this is only one of many grievances First Nations have with the Harper government. There is growing concern among the First Nations community that the Harper government intends to do away entirely with the First Nations’ collective rights. There have been dozens of INM actions in Canada, including the blockade of the Toronto/Ottawa/Montreal track of CN Rail, occupation of major highways, and traditional circle dances by thousands of First Nation members and their supporters that clogged major tourist and shopping districts from Toronto to Calgary. Now, INM has come to the United States. The US is one of many countries holding #J11 Global Day of Action events (#IdleNoMore on Twitter) in which allies have planned protests in support of the Canadian movement. Actions are planned in New Zealand, Australia, Canada, Chile, Colombia, Egypt, Finland, Germany, Hawaii, Italy, Puerto Rico, Sri Lanka and the United Kingdom. “The goal is to raise the profile of the movement, demonstrate our global presence, and give visibility to the growing momentum as a people’s movement first,” one of the solidarity groups states on a Facebook event for today’s protest. I’ll be covering the INM event in New York City today on Twitter.